Introduction: A number of techniques of mesh fixation have been described for a laparoscopic inguinal hernia repair including permanent tacks, absorbable tacks, glues and no fixation at all. Each technique may have unique benefits in terms of perioperative outcomes. A novel technique for the open repair of inguinal hernia recently described is the use of self fixating mesh without the use of additional fixation. 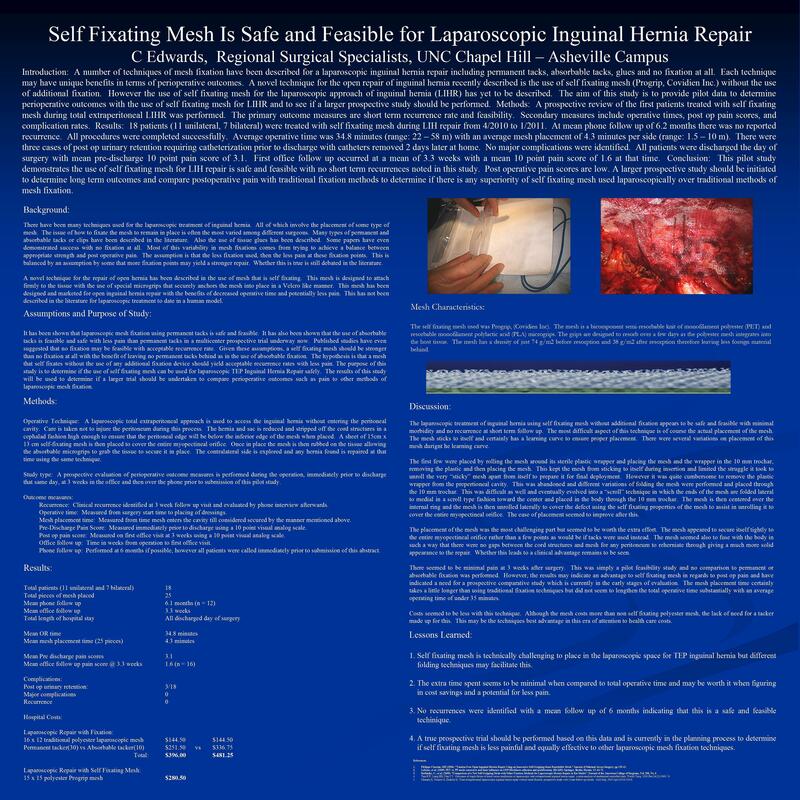 However the use of self fixating (Progrip) mesh for the laparoscopic approach of inguinal hernia (LIHR) has yet to be described. The aim of this study is to provide pilot data to determine perioperative outcomes with the use of self fixating mesh for LIHR and to see if a larger prospective study should be performed. Methods: A small prospective feasibility analysis of the first patients treated with self fixating mesh during total extraperitoneal LIHR is performed. The primary outcome measure is short term recurrence rate. Secondary measures include operative times, post op pain scores, and complication rates. Results: 12 patients (8 unilateral, 4 bilateral) were treated with self fixating mesh during LIH repair from 4/2010 to 9/2010. At mean phone follow up of 13 weeks there was no reported recurrence. Average operative time was 36.9 minutes (range:22 – 58 m) with an average mesh placement of 4.95 minutes per side (range:2 – 10 m). There was one case of post op urinary retention requiring outpatient catheterization. No major complications were identified. All patients were discharged the day of surgery with mean pre-discharge 10 point pain score of 2.5. First office follow up occurred at a mean of 3.4 weeks with a mean 10 point pain score of 2 at that time. Conclusion: This pilot study demonstrates the use of self fixating mesh for LIH repair is safe and feasible with no short term recurrence. Post operative pain scores are acceptable and a larger prospective study should be initiated based to determine long term outcomes and compare postoperative pain with traditional fixation methods.